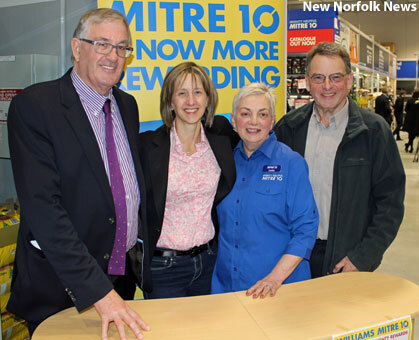 A FAMILY fun day will be held today (Saturday) from 10am-2pm to celebrate the grand opening of the new Williams Mitre 10 store at 10 Charles St, New Norfolk. Although the business has already been trading for two months, today marks the official opening. A function last night was attended by more than 100 guests including customers, suppliers and people involved in the construction of the large new building. Guest speaker Rene Hidding MHA congratulated the family on its investment in the town and described the new store as a quality development. Mitre 10 general manager (operations and trade) Annette Welsh said the New Norfolk store was only the third of Mitre 10's new-style stores to open in Tasmania. She presented the Williams family with a keepsake commemorating the official opening. Ray Williams said the business had started 28 years ago at the original High St location where it initially traded as Village Hardware before starting a long and successful association with the True Value Hardware brand which included several awards for being the best True Value store in Australia. There was another award for the most-improved store when the Mitre 10 branding was adopted. The new hardware store is managed by Peter Williams while the associated Trade Centre run by his brother Adam Williams is another success story which has grown from a small start in Circle St premises, then to the original buildings on the new Charles St/Stephen St site, and across to Back River Rd while the new building went up. Today's grand opening celebrations run from 10am-2pm, featuring a live broadcast by 7HO-FM. There will be face-painting and a coffee van on site, along with a community fundraising sausage sizzle which will continue on Sunday. There is also a range of in-store specials on offer until the close of business on Sunday.